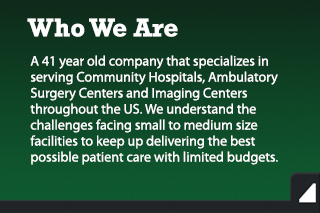 We are a 42-year old family business located in the Kansas City area specializing in Community Hospitals and Ambulatory Surgery Centers throughout the US. We help facilities meet their capital equipment needs, saving big bucks without sacrificing quality. As a leading provider of certified refurbished medical equipment, we are recognized in the industry for our quality, world class customer service and for not cutting corners. today for a no-strings-attached quote. 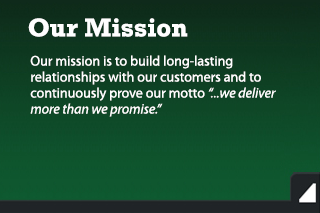 Since 1974, Evergreen Medical has provided their customers a trusted source for their medical equipment needs. 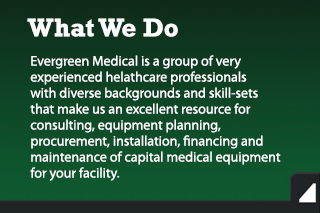 Our experience, quality, long warranties and world-class customer support has made Evergreen Medical a leader in the refurbished medical equipment industry.